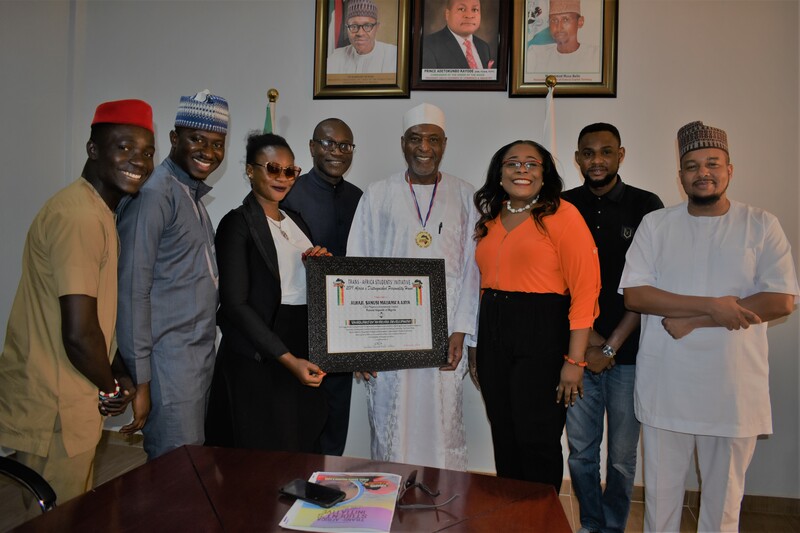 A National Association of Chambers of Commerce, Industry, Mines and Agriculture (NACCIMA) National Vice President, Alhaji Sanusi Maijamaa Ajiya, the Dallatun Bauchi, has been honoured with a prestigious award by the Trans Africa Students’ Initiative (TRASI Africa). Delivering the Award to him in Abuja, the leader of the Pan-African driven initiative delegation, Musa Abdulrauf said, Alhaji Maijamaa was chosen from the pool of other Nigerians for his commitment to the development of the country, dedication to duty, selfless service, Midas touch, quintessential qualities amongst others. “Permit me on behalf of the entirety of students under the coverage of Trans Africa Students’ Initiative to welcome each and everyone here to this dignified occasion of conferring honor on a man of honor, an intellectual juggernaut, an humanist with a Midas touch, a quintessential icon, a legal luminary, a seasoned administrator with top-notch managerial skillset, a man of outstanding understanding and a role model and mentor to African students in the person of Alh. Sanusi Maijamaa Ajiya”. According to him, Alhaji Maijamaa whose strives over the years are outstanding admirable which accounted for why the students body found him worthy to be recognized and appreciated by African Students and also to serve as a step towards encouraging him to do better. “Alhaji Sanusi Maijamaa Ajiya has proven himself to be a man of charisma who can stick out his neck for the course he believes in, TRASI Africa and the entirety of African Students has reckoned you as a man of courage who has zero tolerance for ineffectiveness, a seasoned intellectual with passion for continental development, a noble champion who not only is known for effective service delivery but one who campaigns for it, he indeed is a patriotic Nigerian, a benevolent statesman who is ideologically focused in nation building through his economical prowess, intellectual guidance to acolytes and protégés under his jurisdiction. The body has also embarked on campaigns against drug abuse awareness and other social vices which it called on Alhaji Maijamaa to kindly assist them in propagating. In his response, Alhaji Maijamaa said he was elated at the award especially as it is coming at a time when the younger section of the society have taken into activities and acts that would not assure them of a better tomorrow. “When I was approached for this Award, I never thought it would be something that would be as encouraging and spirit-lifting as it has turned out to be. I am particularly elated because these young Pan-Africans have taken upon their shoulders the responsibility of fighting some illicit acts such as cultism and drugs abuse. “I believe in what they are doing and I therefore want to use this opportunity to call on you never top rest on your oars. Whether you are from this country or the other, we are all one and have one blood flowing in us. We are all Africans and we must take the destiny of our continent into our hands. “I am also happy that young Africans have now chosen to go beyond physical boundaries and stretch hands of fellowship and commitment to the collective good of our people. I will support you and also pray for your success in order to achieve that task you have taken upon yourselves”, Alhaji Maijamaa stressed. TRASI Africa is a Pan-Africa is a development driven initiative birthed by the resolutions of the All African students Union 3rd Annual Youth/Students Summit which held in 2012, that tasked the upcoming generations on contributing vehemently to the development of Africa as a Continent. TRASI Africa has since inception achieved her constituted aims and objectives by building, training and encouraging the teeming Youths and Students via taking part in and also organizing programs and projects all over Africa. TRASI Africa has been able to acquire a wider outreach as her membership now cut across eleven (11) African countries namely: Gambia, Nigeria, Ghana, South Africa, Kenya, Liberia, Botswana, Cameroon, Republic of Benin, Togo and Ivory Coast. Each of the Country chapters coordinates her members in such a way as to channel their energies towards contributing their quota to the development of our nascent democracy, as such we put peculiarities in development and take challenges of our countries into cognizance in choosing our activities, employing contemporary communications and conferencing means – discussing topical issues, such as quality education, insecurity in Africa, Sustainable Development, contributions of students and youths in economic and social development amongst a host of others.